Writes Anette: "About the second blog: its just where I try the new layout for this blog before I go in and change the header and so on;=)"
Swedish singer who used to sing in the Finnish Band Nightwish. Preparing my solo album and taking care of my 2 children Seth and Nemo. 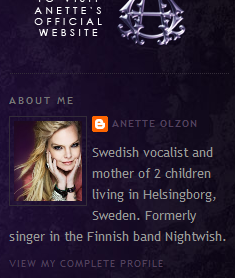 And also the "About me" content has changed: "Swedish vocalist and mother of 2 children living in Helsingborg, Sweden. Formerly singer in the Finnish band Nightwish."